To investigate kinematics and strength in women with patellofemoral pain (PFP) with elevated or low fear avoidance beliefs compared to healthy controls. The authors evaluated knee extension, hip abduction, and hip external rotation strength; trunk, hip, and knee kinematics during a single leg squat (SLS); and Fear Avoidance Belief Questionnaire results in 25 women (16 with PFP and 9 healthy controls). Participants with PFP were divided into elevated fear avoidance belief (E-FAB) and low fear avoidance belief (L-FAB) groups. Participants with E-FAB were significantly weaker than healthy controls in knee extension (P = .03) and hip abduction (P = .04), and performed the SLS with significantly greater ipsilateral trunk flexion (P = .01) compared to the healthy control (P < .001) and L-FAB (P = .01) groups. Participants with L-FAB completed the SLS with less knee abduction than the E-FAB and healthy control groups (P = .001). Participants with PFP with E-FAB presented with lower extremity weakness and increased frontal plane trunk motion during the SLS. Patients with PFP have been found to have increased psychological factors, such as fear avoidance beliefs.14 However, to date there is no evidence examining the influence of fear avoidance on muscular strength and functional movement patterns, two common impairments seen within patients who have PFP. Therefore, the purpose of this study was to compare lower extremity strength and kinematics of the lower extremity and trunk in women with PFP who had E-FAB and low fear avoidance belief (L-FAB) to healthy controls. We hypothesized that patients with PFP and E-FAB would present with decreased lower extremity strength and frontal plane kinematics of the hip and knee compared to the patients with PFP and L-FAB and healthy controls. This case–control study evaluated lower extremity kinematics during a single leg squat (SLS) and lower extremity strength in women with PFP compared to healthy controls. A convenient sample of 25 women was recruited from a local university and community setting: 16 had PFP (mass = 67.0 ± 13.9 kg, height = 166.1 ± 5.9 cm, age = 21.7 ± 4.5 years) and 9 did not (mass = 66.4 ± 8.6 kg, height = 168.3 ± 6.5 cm, age = 20.8 ± 1.4 years). The physical activity subscale of the FABQ was used to separate individuals with PFP into two subgroups: L-FAB (score = 13; n = 9) and E-FAB (score > 13; n = 7).22 The demographic data of the two PFP subgroups were used to match healthy controls according to age, height, and mass. PFP diagnosis and screening for healthy controls included completing a history questionnaire, self-reporting knee function, and a clinical evaluation conducted by a single investigator (NRG) (Table 1). Participants who met the outlined inclusion criteria enrolled in the study and provided written consent, which was approved by the University of Virginia's Institutional Review Board for Health Science Research. Participants with bilateral PFP selected their most painful limb, which was used for all testing. Participants who met inclusion criteria for the study reported to the Exercise and Sport Injury Laboratory for all testing over a single session. Participants completed the Anterior Knee Pain Scale (AKPS) and FABQ physical activity and work subscales. They assessed their worst pain in the past week and their knee pain during the SLS with the Visual Analog Scale (VAS). Participants were given 5 minutes to warm up by walking on a treadmill and were allotted up to 5 minutes of stretching on their own. Following the warm-up, strength of the knee extensors, hip abductors, and external rotators were assessed. A handheld dynamometer (model ACP-MMT; Accelerated Care Plus, Reno, NV) was used to assess isometric strength using the “make” method.23 Peak force was collected in Newtons with three 5-second trials, separated by 30 seconds of rest between each trial. If variance in the strength measurement was greater than 10%, an additional trial was collected.21 Participants were provided a 1-minute rest period between testing positions. Knee extension was conducted in a short seated position on a plinth with the knee and hip both flexed to 90°, and the handheld dynamometer was placed on the anterior tibia, 4 cm superior to the ankle joint.24 Participants maintained an upright trunk position, placed their hands across their chest, and were instructed to keep their hips on the plinth during testing. Hip abduction was completed in a side-lying position with stability straps over the hips and knee. Participants were placed in a position with approximately 20° of hip abduction and 10° of hip extension.25 The handheld dynamometer was secured under the stability strap, 5 cm proximal to the lateral knee joint line.26 The strap placed over the hips was used to minimize pelvic motion during testing. Hip external rotation was completed in a prone position with the knee in 90° of flexion and the handheld dynamometer placed 2 cm superior to the malleolus on the lateral side of the shank.23 A mark was placed on the participant's skin where the handheld dynamometer was positioned on the limb with a marker. The distance between axis of rotation and location of the handheld dynamometer was measured in all three strength tests for all participants to calculate torque. Verbal encouragement was provided during all testing assessments. Following marker set-up, participants stood on their pathological limb in the center of a non-conductive force plate with their contralateral limb flexed to 90°. Five of the nine (55%) healthy participants completed the testing on their dominant limb to allow for a similar percentage of dominant limb as the PFP groups (E-FAB: 5 of 9 = 55% and L-FAB: 4 of 7 = 57%). Participants crossed their arms across their chest and maintained a neutral head position while looking forward during the task. Participants were instructed to squat down as low as possible and return to their starting position while maintaining their balance throughout the assessment. The speed of the squat was standardized to 4 seconds, with a 2-second descent and a 2-second ascent, timed with a metronome. A maximum of three practice trials were provided to each participant prior to data collection. Five SLSs were conducted with a 1-minute break between each trial. Following the final trial, knee pain during the SLS was assessed with the VAS. Force was averaged between the three greatest trials in Newtons for all statistical analyses. Torque (Nm/ kg) was calculated by taking the averaged force value in Newtons multiplied by the moment arm (in meters) and normalized to the participant's bodyweight (in kilograms). All torque assessments were conducted by a single researcher (NRG) with excellent intrarater reliability (ICC3,3 > 0.83) for knee extension, hip abduction, and hip external rotation. Kinematic data were exported in the MotionMonitor software while filtering the data at 6 Hz with a fourth-order, zero-lag, low-pass Butterworth filter. Kinematic data were assessed with Euler angles (Y, X, Z) for flexion/extension, adduction/abduction, and internal/external rotation for joint rotation.30 Hip motion was defined as the thigh relative to the pelvis, knee motion was defined as the shank relative to the thigh, and trunk angles were defined relative to the laboratory coordinate system.31 Kinematic excursions were defined separately for the trunk, hip, and knee in both the frontal and sagittal plane. The excursions were calculated by taking the difference between separate peak kinematic variable of the three joints in both planes during the SLS and the joint angle at SLS before the initiation of the squatting task. Trunk excursions were calculated from the initiation of the task to peak knee flexion. The average kinematic excursions were calculated across the five trials. Although participants completed the work subscale of the FABQ, it was not used for analysis. This score has been previously established as the item to provide maximum information to dichotomize participants by E-FAB and L-FAB.22 All participants who enrolled completed all components of the study. No differences were identified between groups for age, mass, or height. 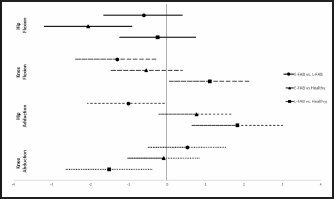 The two PFP subgroups reported worse subjective function (P < .001), higher FABQ (P < .001), greater pain (P < .027), and longer duration of pain (P < .001) compared to the healthy controls (Table 2). Participants with PFP and E-FAB had higher scores on the FABQ (P = .002) and longer duration of symptoms (P = .02) compared to the L-FAB group (Table 2). We also noted a significantly greater VAS score during the SLS for the E-FAB group (4.14 ± 1.92) compared to the L-FAB group (1.95 ± 1.20) (P = .019). A greater VAS score was also seen in the E-FAB and L-FAB groups compared to the healthy control group (P < .001). 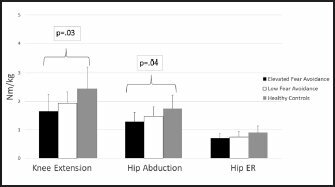 Significant differences were identified between groups for knee extension (P = .03) and hip abduction (P = .04), but not hip external rotation (P = .09). Post-hoc testing revealed the healthy control group was stronger than the E-FAB group in both knee extension (E-FAB: 1.6 ± 0.6 Nm/kg; healthy: 2.4 ± 0.7 Nm/kg, P = .03; d = −1.23 [95% CI: −2.23 to −0.02]) and hip abduction (E-FAB: 1.5 ± 0.3 Nm/kg; healthy: 1.8 ± 0.4 Nm/kg, P = .04; d = −0.85 [95% CI: −1.81 to 0.12]) (Figures 1–2). There were no strength differences between the E-FAB and L-FAB or L-FAB and healthy control groups (P > .05). Significant differences were identified between groups for knee abduction and ipsilateral trunk lean during the SLS. The L-FAB group completed the SLS with significantly less knee abduction compared to the E-FAB and healthy control groups (P = .01) (Table 3). The E-FAB group completed the SLS with the greatest amount of ipsilateral trunk flexion (12.99° ± 2.62°) compared to the L-FAB (7.14° ± 2.02°, P = .010) and healthy control (4.74° ± 2.59°, P < .001) groups. Large effect sizes were seen in hip adduction when comparing the E-FAB and L-FAB groups (d = -1.0, 95% CI: −2.1 to -0.03) and the L-FAB and healthy control groups (d = 1.8, 95% CI: 0.6 to 3.0) (Figure 3). Large effect sizes were also seen among all groups during ipsilateral trunk lean (E-FAB and L-FAB groups: d = 2.46 [95% CI: 1.15 to 3.76]; E-FAB and healthy groups: d = 3.17 [95% CI: 1.78 to 4.55]; and L-FAB and healthy groups: d = 1.02 [95% CI: −0.03 to 2.06]). No statistically significant differences were seen in trunk, hip, or knee sagittal plane kinematics among the three groups (P > .05) (Table 3). Large effect sizes were seen in knee flexion between the E-FAB and L-FAB groups (d = −1.3 [95% CI: −2.4 to −0.2]) and the L-FAB and healthy control groups (d = 1.1 [95% CI: 0.1 to 2.2]) (Figure 3). Pain can result in reduced strength and function over time. 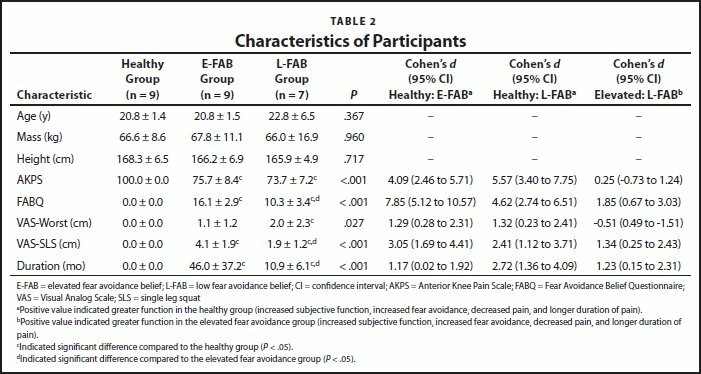 In our study, participants with E-FAB presented with a significantly longer duration of pain (46 months) compared to those with L-FAB (10.9 months) (Table 2). The E-FAB group also presented with greater pain levels during the SLS compared to both the L-FAB and healthy control groups (Table 2). Greater fear avoidance has been a strong predictor of pain in this population.13 Although the E-FAB group demonstrated increased pain during the SLS, it may be due to their trunk kinematics during the squat. The E-FAB group completed the SLS with increased ipsilateral trunk flexion, which may contribute to increased stress on the joint and result in their knee pain (Table 3). Although the E-FAB group had increased knee pain during the squat and had increased trunk motion, this study design does not provide causation between these two variables. We also do not know the exact extent and influence that E-FAB plays on the subjective or objective function in individuals with PFP. Our study examined kinematic differences in the SLS. This test was consistently performed. Although participants were encouraged to squat as deeply as they could while maintaining balance, we did not control for the squat depth. Previous authors have used similar methods, instructing participants to squat as low as possible without standardizing squat depth,33,34 whereas others have required a minimum squat depth.27,35,36 Although the position of the contralateral limb has been found to influence squatting mechanics,36 the depth of the squat on lower extremity and trunk squatting kinematics is unknown within the PFP population. The E-FAB group performed their SLS with 7° less knee flexion than the L-FAB group (Table 3). It is unknown what influenced the depth of the squat for our participants: knee pain, available kinematics of the joints of the test limb, or lack of proximal strength or neuromuscular control. The E-FAB group did have the least amount of knee flexion and the greatest amount of pain during the task (Table 3). There should be some caution when interpreting our findings because we did not control the depth of squat for all participants. Although squat depth has been previously standardized to 60° of knee flexion,27 we instructed our participants to squat as low as possible. Not all participants reached this threshold, but the average knee flexion angle for the three groups was greater than 60°. However, we did not conduct additional subanalyses on FABQ or other squatting kinematics in those individuals who did or did not reach 60° of knee flexion during testing. Future research should evaluate how squat depth may influence trunk and lower extremity kinematics during functional tasks in women with PFP or gaining additional information on what factors influence their squat depth. Although no statistically significant differences existed, possibly due to our small sample size, we did see a large clinically relevant difference in hip frontal plane kinematics, with the L-FAB group having a larger hip adduction excursion compared to the healthy control group (Figure 3). Women with PFP present with increased hip adduction, hip internal rotation, and knee abduction during tasks such as the SLS.27 This altered movement pattern has been suggested to place increased stress on the patellofemoral joint, resulting in increased pain.6,37 In our study, the E-FAB group presented with hip movement patterns similar to the healthy controls during the SLS (Table 3). Increased hip adduction has been found to have a relationship in predicting both subjective function and pain in this population.6 The lack of hip adduction during the squat may be a coping strategy to decrease any potential pain. It is of interest that this subgroup also presented with a significant decrease in hip abductor strength. Gluteus medius strength has been previously found to relate to an increase in hip adduction during functional tasks.30,38 However, this subgroup presented with weakness but a more normal movement pattern. Altered movement strategies of the trunk, specifically ipsilateral trunk lean, might explain the presentation of decreased hip adduction and knee abduction and weakness of the gluteus medius in the E-FAB group. Increased ipsilateral trunk flexion has been suggested to occur in individuals with weakness in their hip abductors,27,39 which was seen in the E-FAB group. Increasing ipsilateral trunk lean may decrease patellofemoral joint stress and allow those with PFP to complete painful tasks with more ease.40 It has also been suggested that individuals with PFP may increase their lateral trunk lean in a strategy to align their femur and tibia,40 which might explain why those with E-FAB had hip and knee kinematics that more closely resembled the healthy population. Piva et al.10 reported that fear avoidance was the strongest predictor of determining an individual's success in a rehabilitation program to decrease their pain and improve their function. Although current treatment programs for individuals with PFP have success in the short term, long-term impairments have been seen in both subjective and objective function.41–44 Assessing psychosocial factors, such as fear avoidance, should be evaluated by clinicians to assist in their development of a treatment plan for patients with a variety of chronic musculoskeletal conditions. The FABQ provides insight into patients' views on altering their behavior due to their knee pain. 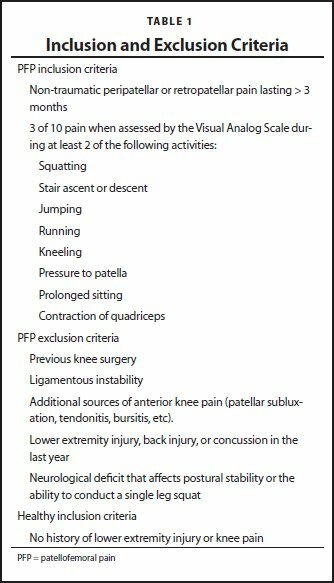 It is essential for clinicians to consider how to improve patients' views on their knee pain and improve their beliefs on what activities will result in pain. Fear avoidance has been recognized to have a relationship to subjective function in a variety of other chronic orthopedic conditions.19,20 Even more intriguing is that E-FAB is non-specific to pathology, and changes in scores in this measure provide insight into identifying both short-term disability and predicting intervention success.12,19,45 Although exercise can be prescribed to improve muscle weakness, if we cannot improve our patients' view that their activity will not result in pain, interventions for this population may continue to produce suboptimal results. Additional models of the role of psychosocial factors in musculoskeletal injury should also be evaluated, such as kinesiophobia, catastrophizing, and pain coping strategies, and their role in both lower extremity function and utility to predict successful treatment options. This is one of the first studies to evaluate differences in lower extremity function in individuals with PFP compared to healthy controls with the use of a fear avoidance belief scale. However, it should be noted that a variety of additional psychological factors have been identified in women with PFP. A recent systematic review evaluating the psychological features associated with PFP identified elevated levels of anxiety, depression, catastrophizing, and fear of movement.14 These factors have also been found to correlate with both pain and physical function, suggesting that psychological concerns should be considered in this population.14 Although this study evaluated the potential relationship with fear avoidance on strength and squatting kinematics, additional studies should evaluate whether anxiety, depression, or catastrophizing influence these commonly seen impairments. This study is not without limitations. It had a small sample size when the PFP group was subdivided by E-FAB and L-FAB. This may be responsible for the lack of statistical difference with moderate to large effect sizes. A larger sample size would provide more appropriate clinical recommendations on how fear avoidance may be related to lower extremity function when assessed by strength and kinematics. Second, we only evaluated kinematic differences between the groups during the SLS. Evaluating additional pain-provoking activities would provide more insight into more generalized connections between the influence of fear avoidance and lower extremity kinematics. We identified a significant difference between groups for duration of symptoms. We did not identify a direct relationship between duration and our variables of interest; however, its relationship and potential role as a confounder to both lower extremity function and fear avoidance is unknown. Finally, the depth of the squat was not standardized, which might explain the increase in hip adduction seen in the L-FAB group. This variable was not controlled in an effort to evaluate whether any hip and knee kinematics exist between the groups. Strength and lower extremity movement patterns are commonly addressed during rehabilitation programs for patients with PFP. Clinicians should be aware that psychological factors, such as fear avoidance, may affect these clinical impairments. Evaluating patient-reported outcome measures that assess psychological factors should be integrated into clinical practice when treating patients with PFP. Women with PFP who demonstrated E-FAB reported longer duration of knee pain and higher pain scores during the SLS. They also were weaker during knee extension and hip abduction strength testing and completed the SLS with increased frontal plane trunk motion. Future research should evaluate the relationship between fear avoidance beliefs, lower extremity strength, and lower extremity kinematics to develop better treatment options for women with PFP. Glaviano NR, Kew M, Hart JM, Saliba S. Demographic and epidemiological trends in patellofemoral pain. Int J Sports Phys Ther. 2015;10:281–290. Blond L, Hansen L. Patellofemoral pain syndrome in athletes: a 5.7-year retrospective follow-up study of 250 athletes. Acta Orthopaedica Belgica. 1998;64:393–400. Ross MD. The relationship between functional levels and fear-avoidance beliefs following anterior cruciate ligament reconstruction. Orthop Trauma. 2010;11:237–243. Boling M, Padua D. Relationship between hip strength and trunk, hip, and knee kinematics during a jump-landing task in individuals with patellofemoral pain. Int J Sports Phys Ther. 2013;8:661–669. McGough JJ, Faraone SV. 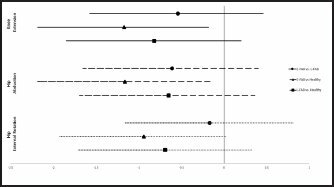 Estimating the size of treatment effects: moving beyond p values. Psychiatry (Edgmont (Pa: Township)). 2009;6:21–29. Khuu A, Foch E, Lewis CL. Not all single leg squats are equal: a biomechanical comparison of three variations. Int J Sports Phys Ther. 2016;11:201–211. Bolgla LA, Earl-Boehm J, Emery C, Hamstra-Wright K, Ferber R. Pain, function, and strength outcomes for males and females with patellofemoral pain who participate in either a hip/core-or knee-based rehabilitation program. Int J Sports Phys Ther. 2016;11:926–935. Additional sources of anterior knee pain (patellar subluxation, tendonitis, bursitis, etc). From the School of Exercise and Rehabilitation, University of Toledo, Toledo, Ohio (NRG); and the Curry School of Education, Department of Kinesiology, University of Virginia, Charlottesville, Virginia (AB, SS).